Today a visitor to Toroni can see the remains of a few walls that project from the ground up to a height of about 2 meters. These castle ruins are what’s left of ancient Toroni (Torone) and have been under excavation for several decades. The narrow causeway that connects the peninsula to the mainland is fenced off, protecting the ruins from anyone trying to enter. From time to time the gate is left open and you’ll see tourists seeking in to take advantage, to wander through what is left of this ancient Greek city-state that had such a turbulent history. At night, the view is spectacular as light illuminate the ruins of Lekythos Castle, like a tombstone to remind us of Halkidiki’s ancient history. While Lekythos Castle may seem insignificant and relatively unknown, it is no doubt Sithonia’s most important archeological site. 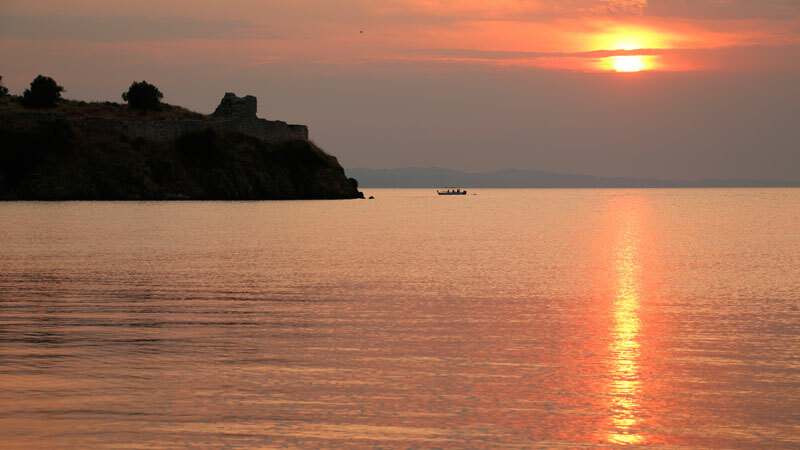 Situated on a promontory at the southern end of the lengthy Toroni beach, where fishing boats are anchored in a tranquil bay, are what remains of a Byzantine fort. This is the most visible reminder of Ancient Torone. But if you are willing to dig a little deeper you’ll find that this memorial of Toroni is just the tip of the iceberg, like the headstone of a grave that points to something worth remembering. Just walking through the surroundings and up to the summit, a whole world opens up, the area is covered in ruins. Remnants of old city walls, water cisterns and outlook posts have been overgrown and reclaimed by nature. Lekythos Castle is just the most visible part of Ancient Torone – one of Northern Greece’s richest and most important cities during the Greek Classical Period. Little is known about Ancient Torone except a few comments mentioned in historical writings and from archeological finds. Mycenaean pottery found in the area suggests that it was an important port along the northern Aegean trade routes already by the 2nd millennium BC. 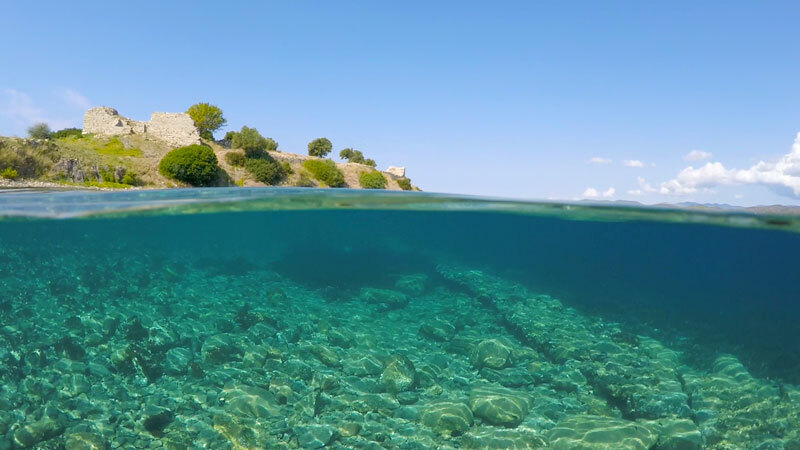 During the 8th and 7th centuries BC, settlers from the city Chalcis, on the island of Euboea, travelled north to settle the Halkidiki peninsula. Torone seems to grow in importance as an organized city during this period of Greek history at the end of the Greek Dark Ages. The name of Toroni also gives insight into the city’s importance. Having its roots in Greek mythology, the name “Toroni” had a connection to Poseidon’s son Proteus. Proteus was known as the old man of the sea with an ability to prophesy. But there seems to be some confusion as to whether Toroni was the wife or daughter of Proteus. Torone as a location is mentioned by Apollodorus in his 2nd c. BC writings entitled “The Library of Greek Mythology” (details below). Here he says that Hercules came to Torone where he was challenged to a wrestling match by the sons of Proteus – Polygonus and Telegonus. Perhaps this symbolized the struggle that Torone had to face to try to survive. The year was 499 BC, Persia ruled the world and was forcing its borders west. The Greeks were nothing but fractious city-states. Already divided, Persia just needed to conquer, or so they thought. As they went about conquering Greek cities in Asia Minor, the Persians would appoint tyrants to rule them. The next 50 years was to define what came to be called the Greco-Persian Wars, as the Greeks organized themselves to fight back. Torone was just a trading outpost but had an impressive harbour. No doubt realizing the eventual outcome,Torone allies itself with the Persians and the ruler put in place was Kritoboulos, a local from Torone. As a reward for their loyalty, the Persians gave Olynthus, a small city to the North that was just conquered by the Persians, to Kritoboulos as a gift. As the Persians were organizing waves of invasions on the Greek mainland by Athens, the smaller Greek army manages to fight off the Persians. These victories pushed the Persians back and allowed the Greeks enough time to organize themselves into Leagues and unite against the Persian empire. Things were changing quickly and so were loyalties, in 479 BC Torone switches sides. By the 479 BC, Torone now joined the Delian League, a large group of city-states that was led by Athens as a defence against the Persian empire. The city states were required to pay a tax to Athens that went into a fund to pay for ship building. Another major Greek power – Sparta, tried to keep Athens in check. They formed their own league called the Peloponnesian League. Even though both leagues were created with the aim of fighting off the Persians, in reality they were trying to outdo each other, competing for Greek dominance. As Athens grew larger and stronger and dominated the sea with its invincible fleet of warships, Sparta felt threatened. This led to the Peloponnesian War in 460 BC and the eventual showdown between these two Leagues. Here is where Torone get mention in the history books with its very small chapter. 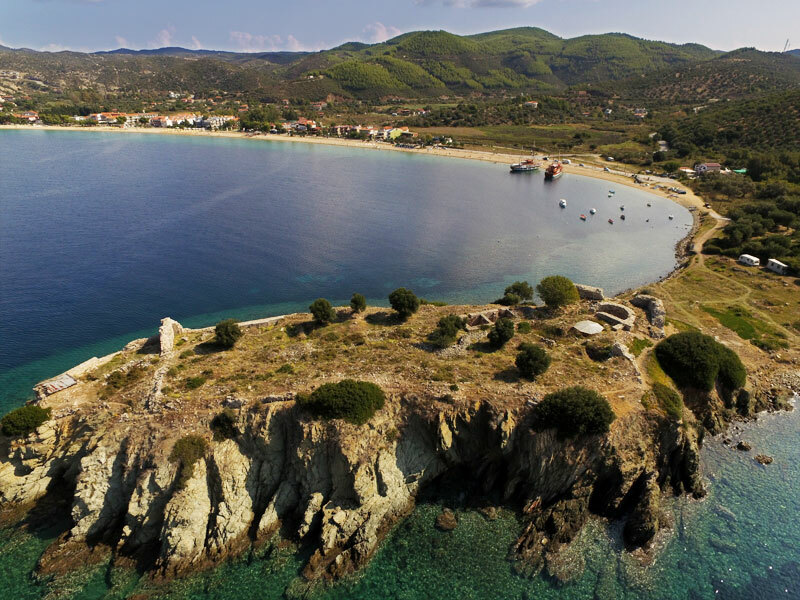 By this time – the 5th century BC – Torone had grown into one of the most important settlements in Chalcidice. As part of the Athenian alliance, Torone even minted its own coins and paid a large tax, 12 talents, to Athens which shows that the city was quite wealthy. The strategic and protected harbour enabled Torone to play a significant role as a trading station between the southern Aegean and the Black Sea, this being the source of its wealth. Here Thucydides writes how a Spartan general, Brasidas, rises up to challenge Athens. As Athens attacks the Peloponnese at its heart, Brasidas decides to create a distraction and take advantage of some discontent in Northern Greece. In 423 BC, Brasidas manages to contact some renegade Toronaeans inside the city for help to overthrow Torone. He then arranges for 20 men to enter the city at night with only knives, and prepare key entrances to be opened. Of the twenty men, only seven have courage enough to be part of the plan. These seven manage to enter and together with the conspirators they open the entrances that allow Brasidas’ men passage into the city. By the time Brasidas himself enters the walls, 100 of his armed men secure the lower part of the city, which enables his army to flood the city and quickly climb up to the Agora on the peak. In the Agora fifty Athenian guards are sleeping. As Brasidas storms the Agora some of the Athenians are killed off but most flee to their ships and a few of them to the fort Lekythos. With all the havoc going on, the citizens of Torone are awakened and confused as to what’s happening. With Torone now under the control of Brasidas, he promises safety to any Toronaean who sides with Sparta. Brasidas next turns his attention to the few Athenian guards who locked themselves in the fort Lekythos. The Athenians start shooting upon the Spartan army from the houses within the fort. As Brasidas prepares to burn them out of the fort with a fire throwing machine, the Athenians decide to build a wooden tower from which they can hurl stones and jars of water at a greater distance. But as the Athenians are carrying up the stones and water jars, the structure gives out under the great weight and comes crashing to the ground with a loud roar. 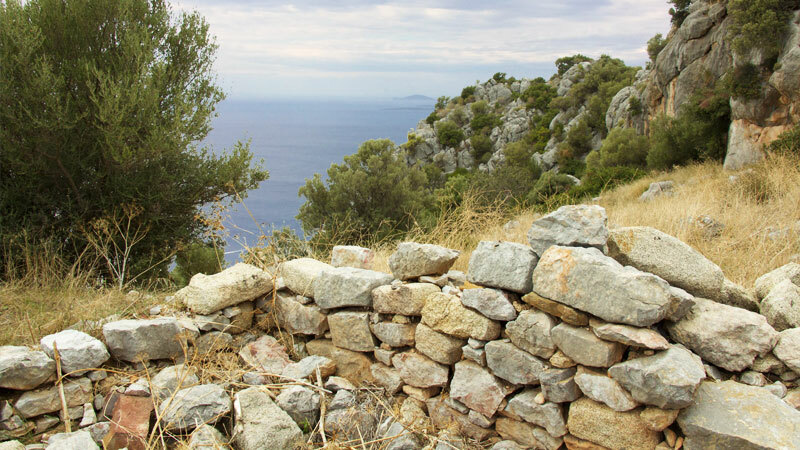 When the Athenians who are hiding at a distance hear the noise, they think that Brasidas must have entered the fort, so they flee to their ships to escape. Any Athenian left behind is killed and Brasidas dedicates the area to the Goddess Athena believing that his victory was given to him not by human intervention. The next year, in 422 BC, the Athenians send General Cleon to reclaim the cities that were lost to Sparta. Cleon is inexperienced but very successful. He returns to Chalcidice to punish the defectors and before Brasidas can arrive to help, Cleon quickly retakes Torone. Brasidas gets news that Torone has fallen when he’s only about 8 kilometers away. Understanding that it’s too late, he retreats and turns back to Amphipolis. Cleon overruns the city and captures 700 men whom he sends to Athens in chains, and the women and children are sold into slavery. Brasidas and Cleon finally meet up in Amphipolis, both to see their final battle. Both generals are killed, but before Brasidas dies he hears news that the Spartans had won the battle against the Athenians. This victory for Sparta breaks the Athenian League and leads to peace in 421 BC. The next challenge to Torone arrives in 348 BC. The Macedonian empire under Philip ll of Macedon is expanding their territory in Northern Greece. Athens is still dominant and holding power in the coastal cities. In this year the Macedonian army makes a forceful invasion south into Chalcidice as it overthrows Olynthus and razes 31 other cities to the ground. The territory of Torone now gets absorbed into the Macedonian empire. In 169 BC the Romans tried to make an attack on Torone and they were repelled. From here it seems that Torone vanishes from the history books. Lekythos castle, the visible remains of Toroni today are the last traces of the ancient city. The castle was rebuilt in the Byzantine era. Apollodorus of Athens in the 2nd c. BC compiled a library that to this day is one of the most useful descriptions of traditional Greek Mythology. And he touched at Aenus, where he was entertained by Poltys. And as he was sailing away he shot and killed on the Aenian beach a lewd fellow, Sarpedon, son of Poseidon and brother of Poltys. And having come to Thasos and subjugated the Thracians who dwelt in the island, he gave it to the sons of Androgeus to dwell in. From Thasos he proceeded to Torone, and there, being challenged to wrestle by Polygonus and Telegonus, sons of Proteus, son of Poseidon, he killed them in the wrestling match. And having brought the belt to Mycenae he gave it to Eurystheus. In Egypt there is a kind of bean which grows upon a thorny stalk; for which reason the crocodiles avoid it, being apprehensive of danger to their eyes. This stalk is four cubits in length, and its thickness, at the very most, that of the finger: were it not for the absence of articulations in it, it would resemble a soft reed in appearance. The head is similar to that of the poppy, being of a rose colour: the beans enclosed in this head are not above thirty in number; the leaves are large, and the fruit is bitter and odoriferous. The root, however, is highly esteemed by the natives as a food, whether eaten raw or well boiled; it bears a strong resemblance to that of the reed. This plant grows also in Syria and Cilicia, and upon the banks of Lake Torone in Chalcidice.